Agriculture is the major sector of Nepalese economy. It provides employment opportunities to 66 percent of the total population and contributes about 36 percent in the GDP. Therefore, the development of agriculture sector is the key for development of national economy. However the lack of improved varieties seems to be a root cause for low agricultural production and poor economic growth of the country. If this situation persists, the significant part of the country’s economy will have to be spent on import of agricultural commodities in the future. 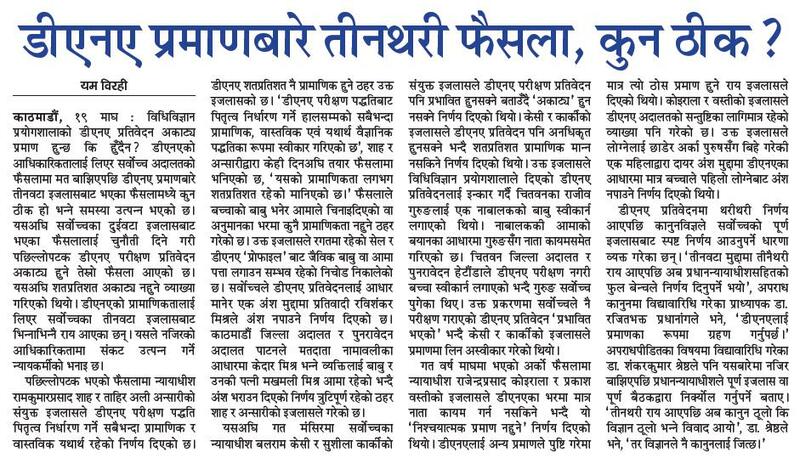 Hence it is high time to go for advanced technologies that enhance agricultural produce to ensure food security in Nepal. In this context, biotechnological innovation and commercialization has great potential for agriculture and economic development of the country. Advanced researches on biotechnology for crop improvements and development and commercialization of GM crops could give definite direction to the agriculture of the country. April 25-26 – James Watson, a biologist from Indiana University, and Francis Crick, a physicist, were working at the Cavendish Lab in Cambridge, England on the structure of DNA. On Saturday, February 28, 1953 it is reported that Crick came into the Eagle, a Cambridge pub, and announced to everyone there that they had “found the secret of life”. In 1953 they proposed the double helix model of DNA. In April of 1953 the Watson and Crick paper appeared in the journal Nature 171: 737-738 & 964-967 (1953). 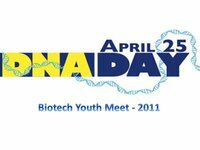 US Congress declared April 25th 2003 as DNA Day to celebrate the completion of the human genome project and the 50th anniversary of the description of DNA. 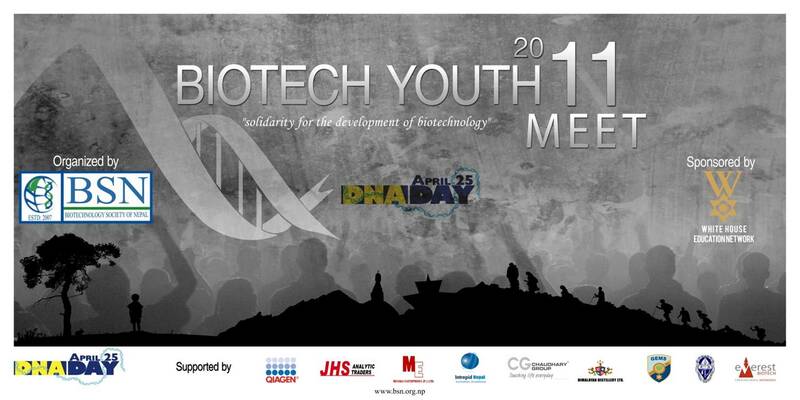 In this regard Biotechnology Society of Nepal (BSN) has been celebrating “World DNA Day” every year since 2008 by organizing different talk programs, seminars, documentary shows and student awareness programs. 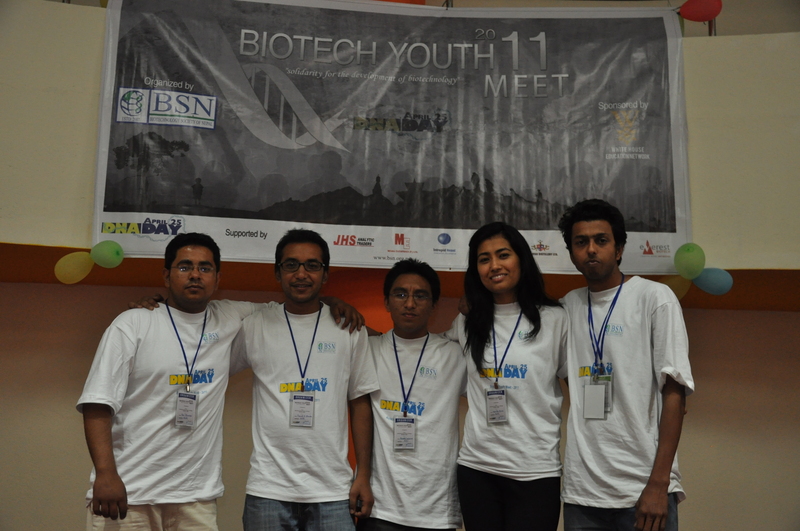 This year also the day was celebrated under the theme “Biotech Youth Meet 2011” at White House institute of Science and Technology (WHIST), Khumlaltar. Over 250 students from biotechnology and applied biological sciences studying at Kathmandu University, Tribhuvan University, WHIST, SANN International College, LBEF College and GEMS institute of Higher education and other different colleges participated. The program was also attendant by more than 50 scientists and researchers from government institutions like NAST, NARC, NAFOL, Government delegates from Public Service Commission (PSC) and Ministry of Science and Technology (MoST) and private sectors. In the program Mr. Jivan Rijal from NAFOL stressed the need of DNA Databank for crime investigation, identification of missing individuals and wildlife management. He also sought for clear act and rules, appropriate education for judges and law students and support for scientific community for making the judgment based on scientific evidence. Speaking at the program, Mr. Dibesh Karmacharya, Executive Director of Intrepid Nepal Pvt. Ltd. emphasized on the 3-C (Communicate, Collaborate and build the biotech Community) for the development of biotechnology in Nepal. Similarly, Dr. Sameer M. Dixit, Country Director of Center for Molecular Dynamics Nepal (CMDN) highlighted the role of biotechnology in public health and biomedical research. Speaking at the program, Dr. Kayo Devi Yami, acting chair person PSC of Nepal stressed on need of taskforce comprising researchers, scientists, biotech graduates and concerned stakeholders to pressure the concern ministries and line agencies to recruit the biotech graduates via PSC. She also clarified that PSC only cannot recognize the biotech graduates until the concerned ministries demand for the post and also assured that PSC will work at high speed in developing curriculum for recognition of those graduates. During the program, Mr. Ganesh Shah, former minister, MoST wished for capturing first Nobel Prize for Nepal in the field of biotechnology by encouraging the scientific community and graduates and assured that he is dedicated for the development for biotechnology in Nepal. He also said about the entrepreneurial activity apart from research for contributing economic growth of the country. He added that unification in work and sharing of facilities currently available is inevitable for sustainability and growth. Mr. Mukunda Raj Prakash Gimire, Joint Secretary of MoST and also the Coordinator of Biotechnology and Bioinformatics Technical Team said that government is working for the development of Biotechnology and also highlighted the Biotechnology policy of Nepal 2063. Speaking at the program, Dr. Dinesh Raj Bhuju, Head of Faculty of Science, NAST focused on the facilities and opportunities available for biotechnology graduates and future works of NAST in this field. Similarly, Dr. Mukunda Ranjit, President of Nepal Biotech Association (NBA) highlighted the need of government investment, as India has done in early 90s, for the development of Biotechnology. Similarly, Dr. Janardan Lamichhane, Vice President of Regional Branch Office, Asian Federation of Biotechnology (AFOB) emphasized the need of technology transfer and collaboration among different international research institutions for capacity building and establishment of state-of-the- art facilities. Speaking at the program, Mr. Rajiv Singh, Head of Institute, WHIST highlighted the need of collaborative effort among different biotech institutions for upliftment of biotechnology and development competent graduates. In the program, Mr. Ravi Bhandari, Vice President of BSN highlighted current projects of BSN like e-bulletin, e-interview, article on demand (AOD), brain drain to brain gain and BSN journal entitled Nepal Journal of Biotechnology (NJB) which will ultimately enhance the academic knowledge of students, scientists and researchers in this field. He also added that BSN will come up with new projects and opportunities for them. Mr. Prajwal Rajbhandari, a MS by Research (Bio-Technology) graduate from Kathmandu University focused on the unity among biotech graduates, faculty members for uplifting new born subject in Nepal and role of BSN in fulfilling this. 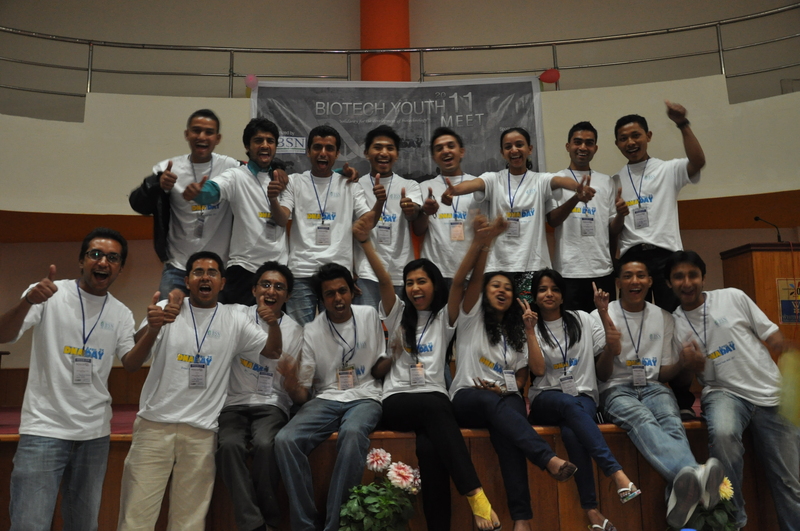 Similarly, Mr. Hemanta Raj Mainali, Teaching Assistant and Biotech graduate from Department of Biotechnology, Kathmandu University said that involvement of youth is inevitable for development of biotechnology in Nepal and need of such program for making the awareness among the different stakeholders for collaborative effort. The program was organized by Biotechnology Society of Nepal (BSN), sponsored by WHIST and supported by JHS Analytic Trader, Menaka Enterprizes, Intrepid Nepal, Chaudhary Group, Himalaya Distillery, GEMS/AUF and Everest Biotech. Also, on 26th of April, Mitra Kunj/Nepal Science and Technology Development Forum/ Russia Centre of Science and Culture headed by Mr Ganesh Shah also celebrated World DNA Day on the topic “Talk program on Biotechnology”. Speaker for the program were Dr. Janardan Lamichhane, Associate Professor at Department of Biotechnology, Kathmandu University and Dr. Pramod Aryal, Chief Scientific Officer at Deurali Janata Biotech Pharma, a Biotech wing of renowned pharmaceutical company Deurali Janata Pharmaceuticals Limited (DJPL). Available online 20 September 2010. Soybean-nodulating bradyrhizobia are genetically diverse and are classified into different species. In this study, the genetic diversity of native soybean bradyrhizobia isolated from different topographical regions along the southern slopes of the Himalayan Mountains in Nepal was explored. Soil samples were collected from three different topographical regions with contrasting climates. A local soybean cultivar, Cobb, was used as a trap plant to isolate bradyrhizobia. A total of 24 isolates selected on the basis of their colony morphology were genetically characterized. For each isolate, the full nucleotide sequence of the 16S rRNA gene and ITS region, and partial sequences of the nifD and nodD1 genes were determined. Two lineages were evident in the conserved gene phylogeny; one representing Bradyrhizobium elkanii (71% of isolates), and the other representing Bradyrhizobium japonicum (21%) and Bradyrhizobium yuanmingense (8%). Phylogenetic analyses revealed three novel lineages in the Bradyrhizobium elkanii clade, indicating high levels of genetic diversity among Bradyrhizobium isolates in Nepal. B. japonicum and B. yuanmingense strains were distributed in areas from 2420 to 2660 m above sea level (asl), which were mountain regions with a temperate climate. The B. elkanii clade was distributed in two regions; hill regions ranging from 1512 to 1935 m asl, and mountain regions ranging from 2420 to 2660 m asl. Ten multi-locus genotypes were detected; seven among B. elkanii, two among B. japonicum, and one among B. yuanmingense-related isolates. The results indicated that there was higher species-level diversity of Bradyrhizobium in the temperate region than in the sub-tropical region along the southern slopes of the Himalayan Mountains in Nepal. नीता-राजिवको मुद्दामा राष्ट्रिय विधि विज्ञान प्रयोशालाले पेस गरेको डीएनए परीक्षणको प्रतिवेदन अस्वीकार गरिनुको कारण यस प्रकारको परीक्षणमा हुनसक्ने सम्भावित त्रुटि हुनसक्छ। त्रुटि त हरेक पेसामा हुनसक्छ। हो, यस्ता सम्भावित त्रुटि हुन नदिन वा न्यूनीकरण गर्नेतर्फ सम्बन्धित सबैको ध्यान जानु आवश्यक छ। राष्ट्रिय विधि विज्ञान प्रयोशालाका वैज्ञानिकहरूकाअनुसार उक्त प्रयोगशालामा गरिने डीएनए परीक्षण त्रुटिरहित छ र यसलाई अन्तर्राष्ट्रिय प्रयोगशालालेसमेत प्रमाणित गरेका छन्। तसर्थ राष्ट्रिय विधि विज्ञान प्रयोगशालामा गरिएको डीएनए परीक्षणमाथि शङ्का गर्ने उचित आधार देखिँदैन। शङ्का लागेको भए परीक्षण दोहर्‍याएर गर्न सकिन्थ्यो। परीक्षणमा लापरवाही भएको प्रमाणित भएमा सम्बन्धित वैज्ञानिक वा प्राविधिज्ञलाई उचित दण्ड दिने कानुनी व्यवस्था पनि गर्न सकिन्छ। तर एक्काईसौँ शताब्दी र वैज्ञानिक युगमा विज्ञानमा आधारित प्रमाणले खास कारणबिना मान्यता नपाउनुले हामी आधुनिक समयसँग हिँड्न नसकेको वा नचाहेको र पुरानै रुढिवादी समाजमा बाँच्न चाहेको ठहरिन्छ। नेपाली समाजका हरेक वर्ग र क्षेत्रमा वैज्ञानिक चेतनाको कमी पाइन्छ। विज्ञानमा आधारित प्रमाणले मान्यता नपाउनु पनि यही अवस्थाको एक सङ्केत हो कि? Mitochondrial and Y-chromosome diversity of the Tharus (Nepal): a reservoir of genetic variation. BMC Evol Biol. 2009 Jul 2;9:154. Fornarino S, Pala M, Battaglia V, Maranta R, Achilli A, Modiano G, Torroni A, Semino O, Santachiara-Benerecetti SA. BACKGROUND: Central Asia and the Indian subcontinent represent an area considered as a source and a reservoir for human genetic diversity, with many markers taking root here, most of which are the ancestral state of eastern and western haplogroups, while others are local. Between these two regions, Terai (Nepal) is a pivotal passageway allowing, in different times, multiple population interactions, although because of its highly malarial environment, it was scarcely inhabited until a few decades ago, when malaria was eradicated. One of the oldest and the largest indigenous people of Terai is represented by the malaria resistant Tharus, whose gene pool could still retain traces of ancient complex interactions. Until now, however, investigations on their genetic structure have been scarce mainly identifying East Asian signatures. RESULTS: High-resolution analyses of mitochondrial-DNA (including 34 complete sequences) and Y-chromosome (67 SNPs and 12 STRs) variations carried out in 173 Tharus (two groups from Central and one from Eastern Terai), and 104 Indians (Hindus from Terai and New Delhi and tribals from Andhra Pradesh) allowed the identification of three principal components: East Asian, West Eurasian and Indian, the last including both local and inter-regional sub-components, at least for the Y chromosome. CONCLUSION: Although remarkable quantitative and qualitative differences appear among the various population groups and also between sexes within the same group, many mitochondrial-DNA and Y-chromosome lineages are shared or derived from ancient Indian haplogroups, thus revealing a deep shared ancestry between Tharus and Indians. Interestingly, the local Y-chromosome Indian component observed in the Andhra-Pradesh tribals is present in all Tharu groups, whereas the inter-regional component strongly prevails in the two Hindu samples and other Nepalese populations.The complete sequencing of mtDNAs from unresolved haplogroups also provided informative markers that greatly improved the mtDNA phylogeny and allowed the identification of ancient relationships between Tharus and Malaysia, the Andaman Islands and Japan as well as between India and North and East Africa. Overall, this study gives a paradigmatic example of the importance of genetic isolates in revealing variants not easily detectable in the general population. Neonatal hypothermia is associated with an increased mortality risk for 28 days. There are few community-based data on specific risk factors for neonatal hypothermia. Estimates of association between neonatal hypothermia in the community and risk factors are needed to guide the design of interventions to reduce exposure. A cohort of 23,240 babies in rural southern Nepal was visited at home by field workers who measured axillary temperatures for 28 days (213,316 temperature measurements). The cumulative incidence of hypothermia (defined as <35.0degreesC based on an analysis of the hypothermia-mortality risk relationship) was examined for any association with infant characteristics, care practices and parental, household, socioeconomic and demographic factors. Estimates were adjusted for age and ambient temperature. Ten percent of the babies (n=2342) were observed with temperatures of <35.0degreesC. Adjusted prevalence ratios (Adj PR) were increased among those who weighed< 2000 g [Adj PR=4.32 (3.73, 5.00)] or <1500 g [Adj PR=11.63 (8.10, 16.70)] compared to those of normal weight (>2500 g). Risk varied inversely along the entire weight spectrum: for every 100 g decrement hypothermia risk increased by 7.4%, 13.5% and 31.3%% for babies between 3000 g and 2500 g, 2500 g and 2000 g and <2000 g, respectively. Preterm babies (<34 weeks), females, those who had been first breastfed after 24 h and those with hypothermic mothers were at an increased risk. In the hot season the risk disparity between smaller and larger babies increased. Hypothermia was not associated with delayed bathing, hat wearing, room warming or skin-to-skin contact: they may have been practiced reactively and thereby obscured any potential benefit. In addition to season in which the babies were born, weight is an important risk factor for hypothermia. Smaller babies are at higher relative risk of hypothermia during the warm period and do not receive the protective seasonal benefit apparent among larger babies. The need for year-round thermal care, early breastfeeding and maternal thermal care should be emphasized. Further work is needed to quantify the benefits of other simple neonatal thermal care practices.